A few years back this family memorized a “creed” found at the beginning of a Gideon New Testament, and this summer we decided to re-learn it. I have a Great-Uncle Ralph from Idaho that often quotes this “creed.” I could not find the author. The Bible contains the mind of God, the state of man, the way of salvation, the doom of sinners, and the happiness of believers. Its doctrines are holy, its precepts are binding, its histories are true, and its decisions are immutable. Read it to be wise, believe it to be safe, and practice it to be holy. It contains light to direct you, food to support you, and comfort to cheer you. 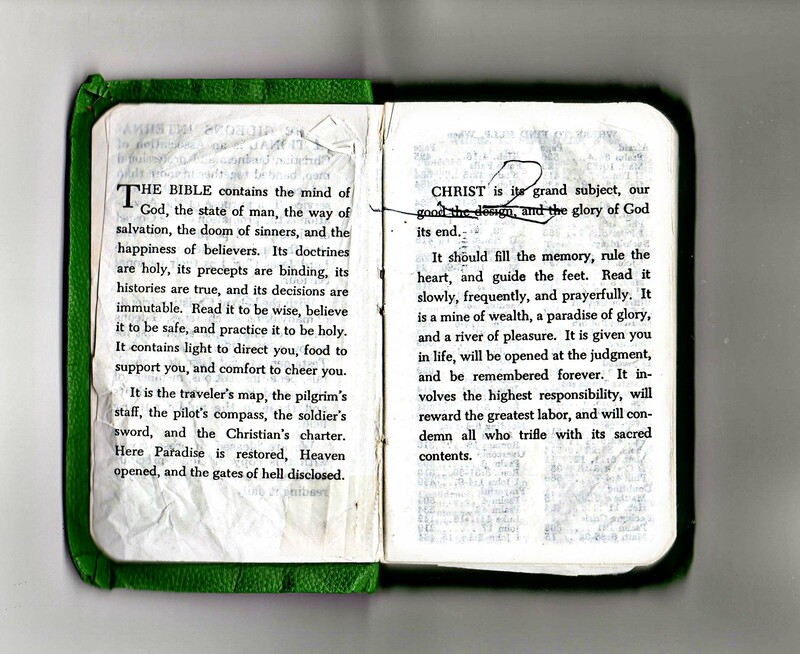 It is the traveler’s map, the pilgrim’s staff, the pilot’s compass, the soldier’s sword, and the Christian’s charter. Here Paradise is restored, heaven opened, and the gates of hell disclosed. Heard this quoted as a kid and it has never left me. I am now in my 50’s and it still encourages me today. The Bible is all of the above!